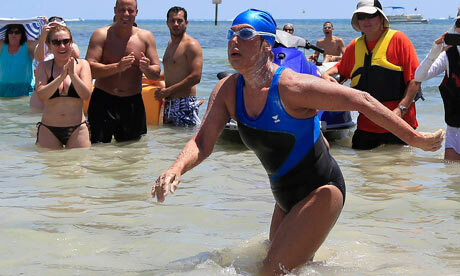 This entry was posted in Uncategorized and tagged Diana Nyad, nominative determinism. Bookmark the permalink. My last name, Ribbans, an unusual one (unless you live in East Anglia) is said to derive from Revans. This in turn is thought to be a derivative of Reeve. The Reeve in medieval England was the administrator of the parish or estate, and as such probably one of the few who could write. As for me, I am aware of that family nomenclature and felt a compunction, often not matched by talent, to write. Whether though, as you say, it is a self-fulfilling legacy or one carried in the other (97%) of DNA, who knows, but I had never heard of nominative determinism before, and now the weight of history hangs even heavier on my shoulders… thanks for that!! p.s. Our Accommodation Officer at Uni regaled in the name Mrs. Anne House. Perhaps nominative determinism can be inherited through marriage also?? Thanks for that – it *is* fascinating, isn’t it? The reeving/writing thing is strong in your clan! Didn’t know your Mum was a poet. As for me, I think my surname is originally Germanic: Wald meaning forest. You might recall my Dad’s hobby was carpentry and, in particular, wood turning on a lathe. He was passionate about nature – and loved trees. I don’t have his skills in wood working but he certainly passed on a passion for trees to me. As for the effect of marriage – hard to say. BTW, I’m intrigued to hear that there is a character called Walder Frey in Game of Thrones (haven’t watched it yet). My surname is Wynter, and I moved to England from Australia, nuff said.